Brakes bowed out in the last eight of the Birmingham Senior Cup after a low-key tie against a youthful Birmingham City side, writes Paul Okey. The inclusion of James Fry in the visitors’ line-up only added to the pre-season feel which swirled around the New Windmill on the back of a strong, game-ruining crosswind. Handed a midfield role by his parent club after having previously turned out for the Blues in the competition, Fry set up the winner to ensure a less than cordial welcome next time he steps into the Brakes dressing room. As both sides struggled to adapt to the wind, the first half an hour featured precious little goalmouth action, just one shot but two goals. Simon Forsdick opened the scoring for Brakes in the sixth minute, receiving a quick throw-in near the corner flag and sending in a cross which caught on the wind and curled into the top corner, with keeper Nick Townsend helpless. Blues were level in the 15th minute, with Olly Lee confidently sweeping the ball home after a neat move had cut through the home backline. Such was the strength of the wind that it proved of little advantage to Brakes in the first half, with several balls forward catching on it and going out of play. The problems with the conditions were further underlined when a Jordan Goddard corner curled straight out of play behind the goal and went one bounce over the North Bank fencing. Danny Newton flashed a shot narrowly wide on the turn, and at the other end, Fry was left in space to chest down a free-kick into the box, with Jack Edwards recovering well to block his goalbound effort. Edwards then got on the end of a Goddard free-kick but his header was comfortable for Townsend. As the interval approached, Liam Truslove was inches away from giving Blues the lead, with his header from Fry’s cross landing on top of the home net. Townsend was the first keeper called into action after the break, acrobatically punching away an Aron Wint cross as two attackers lurked. Atkins got the faintest of touches to a Reece Brown piledriver and from the resultant corner City took the lead. The ball looked to be drifting out of play but Fry did not give up and hooked it back from the byeline to give George McGee the simplest of tasks to stoop and head the ball home from two yards out. Lee dragged a shot wide before Paul Holleran made his first change, with Stephan Morley coming on for goal-scorer Forsdick. A Goddard free-kick drew a sprawling save from Townsend and Newton dragged a shot wide before James Mace went agonisingly close to an equaliser with a glancing header from a corner. Brakes were then incensed when Husband appeared to have his legs taken from under him as he shaped to shoot inside the box, with referee Neil Pratt waving away their appeals. 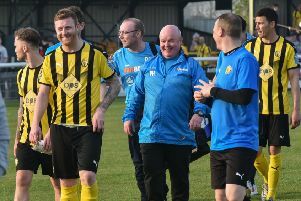 It was to prove Husband’s last involvement in his 299th game for Leamington, with Lee Moore replacing him for the final 15 minutes. However, it was to be the visitors who came closest to adding to their tally, with a late strike chalked off for offside. Brakes: Ross Atkins, James Mace, James Husband (Lee Moore, 75), Luke Connolly (Joe Magunda, 67), Delroy Gordon, Jack Edwards, Aron Wint, Jordan Goddard, Simon Forsdick (Stephan Morley, 63), Lee Chilton, Danny Newton Subs not used: Martyn Naylor, Lewis Fenney. Birmingham City: Nick Townsend , Josh Cogley, Bobby Moseley, James Fry, Wes Harding, Amari’i Bell, Liam Truslove, Olly Lee, George McGee (Luke Armstrong, 69), Reece Brown, Viv Solomon-Otabor. Subs not used: Callum Preston, Charlie Cooper, Dom Bernard.